The Intersections & Beyond: Last chance to catch La Diva, Ms. Cherie Gil in "Master Class"
Last chance to catch La Diva, Ms. Cherie Gil in "Master Class"
Cherie Gil has done numerous roles for TV and movies. 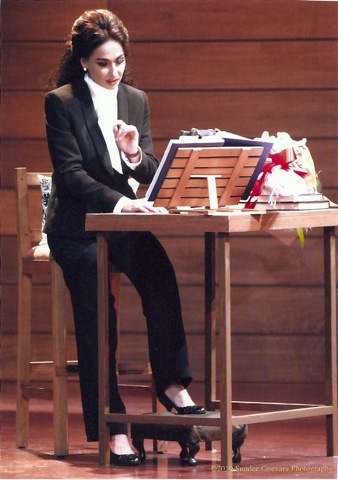 As Maria Callas, Cherie portrayed her character with much depth and class as an opera diva and master teacher in Master Class. She demonstrates the role with both ease and intensity that Terrence McNally may have written and prepared for her. Master Class is based on the real master classes conducted by the renowned opera singer Maria Callas (1923-77) at the Julliad School of Music in New York in the years 1971-72. Callas was a strong woman, considered the greatest soprano of her generation and also a controversial figure. Despite her tempestuous personality that often ended into disputes with opera managements and disagreements with other singers, she was still loved and adored by her fans. Controversies about her relationship with Aristotle Onassis, a wealthy Green shipowner, didn't spare her from the public's eye. Terrence McNally wrote the play as a tribute to Maria Callas whom he adored as a fan since his high school days. Although the play tells the story about the truimphs and tragedies of Callas' life, the primary focus is on dramatic singing. Serious in her art, Callas teaches her students (2 sopranos and a tenor) how it is to sing with their whole heart and how demanding the profession of opera singing can be. Oliver Oliveros of Broadwayworld.com remarks, “Ms. Gil didn't only work on an engaging character study of the controversial singer - the woman bared her soul. She had brought to life Callas' fierce personality, wisdom and vulnerability with an unselfish commitment, unmasking a rather helpless and tragic persona of the 'La Divina' that once lit up the stage at The Scala. In a class of her own, Ms. Gil exuded, breathed, and spoke Callas from that very intimidating first entrance to her humbling last exit - a compelling theatre experience something seldom felt in local straight play productions." This is an aria from Tosca entitled, "Recondita Armonia" which Juan Alberto Gaerlan (tenor) sang during the presscon of Master Class. My apologies, I'm showing you a different artist here because this is the video available from the net. I seldom watch opera. Not that I don't like to, but opera may be the last thing in my mind. I realized that when you expose yourself to opera (and now with Master Class, a play), you get to see the beauty and splendor of its music, especially when the performers sing with a great deal of discipline, control and grace. Cherie Gil and the singers from the Philippine Opera Company is a perfect combination! I will not deny from you that the voice of Juan Alberto Gaerlan and Kay Balajadia-Liggayu gave me serious goosebumps! Master Class will have its final run at the Carlos P. Romulo Theater, RCBC Plaza this week on August 12,13, 14 and 15, 2010. Thursdays, Fridays and Saturdays at 8 p.m. and Sundays at 3:30 p.m. You can check out for more info and photos here. Master Class is produced by the Philippine Opera Company and is directed by Michael Williams. Also featured are Juan Alberto Gaerlan as Anthony Candolino and Al Gatmaitan (alternate), Florence Aguilar as Sophie de Palma, Ana Feleo as Sharon Graham and Kay Balajadia-Liggayu (alternate), Chino Veguillas as stage hand and Francis Amora as the pianist Manny. Master Class is supported in part by the Yuchengco Group of Companies, Robinsons Luxuria of Robinsons Land Corporation, Lyric, Lifestyle Network, Make Up For Ever, Odyssey Music and Video and 105.1 Crossover.